While Paris may hold the title of ‘Fashion Capital of the World’, Milan is her runner-up (if not her better understudy). Considered one of the chicest, sophisticated and fashion conscious cities in all of Italy, every big name fashion brand has a store in Milan, displaying the latest clothing and accessories direct from the catwalk – trends that won’t reach the rest of the world for months. The style in Milan is decidedly cutting-edge, which is why we’re so much in love with it, changing constantly to reflect the newest trends and fads amongst fashionistas. Milan is also a big city with plenty of attractions and sights, but the primary designer shopping district is remarkably compact, making it dangerously simple to flit from store to store with credit card in hand, even if you’re just visiting for a few hours as part of a European cruise to nearby Genoa. Known as Quadrilatero d’Oro – directly translated as Golden Quadrilateral – the district connects four streets in the city lined with designer stores which span almost one mile: Via della Spiga, Via Sant’Andrea, Via Alessandro Manzoni and Via Montenapoleone. Along these streets shoppers can discover the delights of Hermes, Miu Miu, Chanel, Giorgio Armani, Versace, Stella McCartney, Tiffany and Gucci, to name just a select few. There’s even Armani Junior for young fashion lovers, but it’s really all about the bespoke shoe designers and stores like Mario Leoni, Barbara Beryl (La Vetrina di Beryl), Berluti, and Le Solferine. However, Milan’s big name brands aren’t restricted solely to this Quadrilatero d’Oro, and a few of the world-renowned fashion labels have spread out into some of the city’s shopping malls. 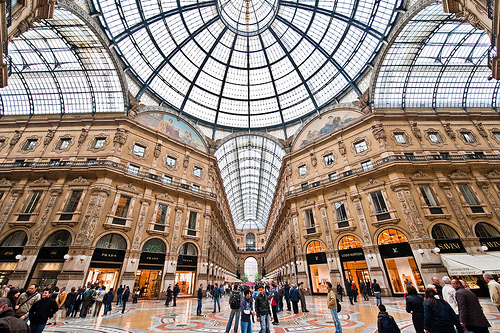 Shopping malls can be found all over Milan, and Italy’s oldest mall is actually located right in the heart of the city. Built in 1877, the Galleria Vittorio Emanuele II made news in 2012 for making the somewhat controversial decision not to renew the lease of the McDonalds fast food restaurant that had been serving up burgers and fries for 20 years. The store’s replacement? The mall’s second Prada store. This emphasizes just how much Milan is striving to remain at the top of its game. These designer stores are fascinating to look round and view the unique and gorgeous creations, but the price tags can be downright terrifying, we must admit. Fortunately, Milan caters to everyone, and the quick-moving trends within the ever-changing fashion world particularly lend themselves to outlet malls and stores. Travelers looking for a day excursion from their cruise and who love fashion but hate the prices should consider a trip to Fidenza Village, located 70 miles south of Milan, close to Parma. 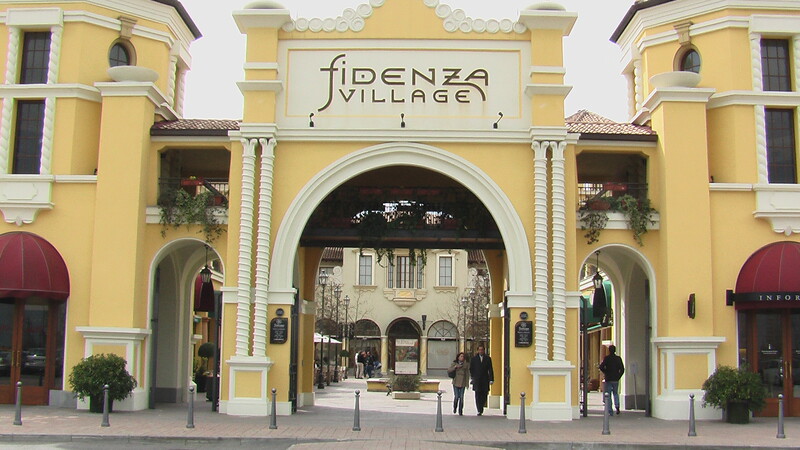 Boasting ‘chic outlet shopping’, Fidenza Village is like the Disneyland of fashion. The village has been purpose-built to display older, yet still current, trends at hugely reduced prices. The village operates a ‘Shopping Express’ bus from Milan, leaving at 10 a.m. and departing the village at 6.30 p.m., giving shoppers a full three hours to browse through hot trends at discount prices. Whether you’re a fashion lover or not, if you’re in Milan then the shopping district just isn’t to be missed. Beautiful and sophisticated designs are interspersed with the most bizarre creations you can imagine. Although some believe that Milan has been trumped by Paris in terms of fashion and style, the city is without a doubt the best place in Italy for picking up gifts and treats from the biggest fashion houses in the world. Just be sure to take a credit card… or two! This entry was posted in italy travel, style and tagged italy outlet shopping, milan shopping. Bookmark the permalink. Milan is really a treasure for all kind of sophisticated and fashion conscious city to browse hot trends at discount prices under one roof.